DESCRIPTION: Soft PVC goggles with a large support area around the entire face for an increased comfort. Aerodynamic form with polycarbonate 5-point bending lens for a better vision without distortion. Aeration system which prevents fogging thanks to small holes both in the upper and in the lower part of the frame. 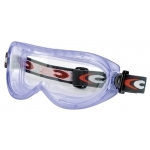 Compatible with the use of corrective glasses and dust masks of COFRA lines Pioneer and Starter. High level of protection against impact, liquid splashes, unrefined dust, splashes of molten metal and penetration of hot solids. Wide elastic headband (25 mm – 0,98”) easily adjustable thanks to a buckle system and to a mechanism of rotating application, for the maximum adaptability to the face.